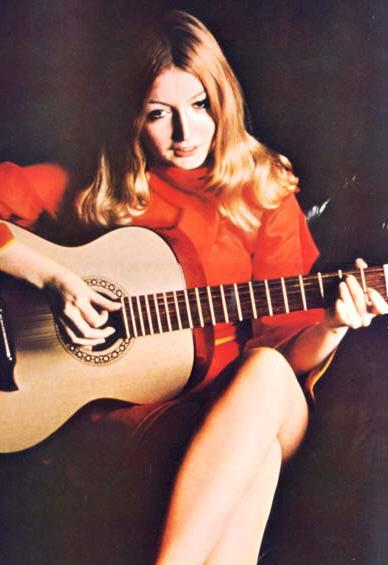 I think that a 60s singer like Mary Hopkin is the true definition of a songstress: no costumes, no embellishments, just a lovely voice with the bonus of having a pretty face to go along with it. To quote one of the songs she made famous, those were the days, my friends. Mary is probably best known for being one of the first artists to record on the Beatles' Apple recording label. Born in Wales in 1950, she got her big break when the model Twiggy saw her perform on a British talent show called Opportunity Knocks, who then told Paul McCartney to check her out. She had a hit with Those Were the Days, her debut single, which was produced by McCartney. It reached number one on the UK charts and number two in the U.S. (Cynthia Lennon recorded a version of the song years later which, needless to say, is not quite as noteworthy as Hopkin's version.) Another single, Goodbye, was written by McCartney for her. It's a little surprising that Hopkin didn't seem to get as famous in the States as she should have been, but when she got married in the early 70s, she dropped out of the music business for a few years. She did return to recording and has been involved in numerous musical projects up until the present. I can't do her career justice here - just to say a couple of her hits are the Forgotten Friday Favorites this week. Enjoy! She is one of the best singer. I really like her voice too. Thanks for sharing. Oh my favorite Go Retro topic and I was sick all weekend, missing Forgotten Friday Favorites! I have never heard of Mary Hopkin. Thanks for these! I have purchased two of her Apple 45s in the last 10 months. Those Were the Days and Goodbye. Also got her Postcards LP on Apple. What a great voice. As an aside there was some talk that Paul McCartney would do his Goodbye on tour...we await. I've never heard of her but I'm going to check out her songs. Did you ever do a post on Pattie Boyd, George Harrison's and later, Eric Clapton's wife? I'm reading her autobiography currently. She was at the center of Rock and Roll for years and a queen of the Sixties. Fascinating person. Yes, I did, although it may have been on my old blog...I read her autobiography...being married to a jackass like Clapton sounded like pure hell and I think she regretted not trying to make it work with George. She was deeply in love with him.